Autumn olives (Elaeagnus umbellata) are an abundant, invasive berry here in the Northeast. It turns out they are highly nutritious, containing lots of lycopene, which is a strong antioxidant good for joint health, cardiovascular disease, diabetes, and cancer treatment. Lycopene is a phytochemical, and it is in the red pigment of many foods like tomatoes, watermelons, and pink grapefruits. Autumn olives contain fantastic amounts of lycopene, some studies stating 17 times the amount of raw tomatoes. 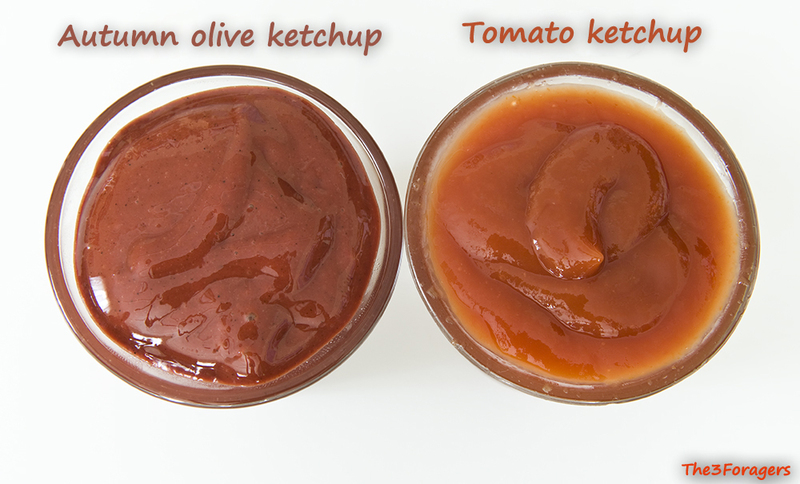 Here is a quick read from the USDA and Utah State University on their lycopene findings. 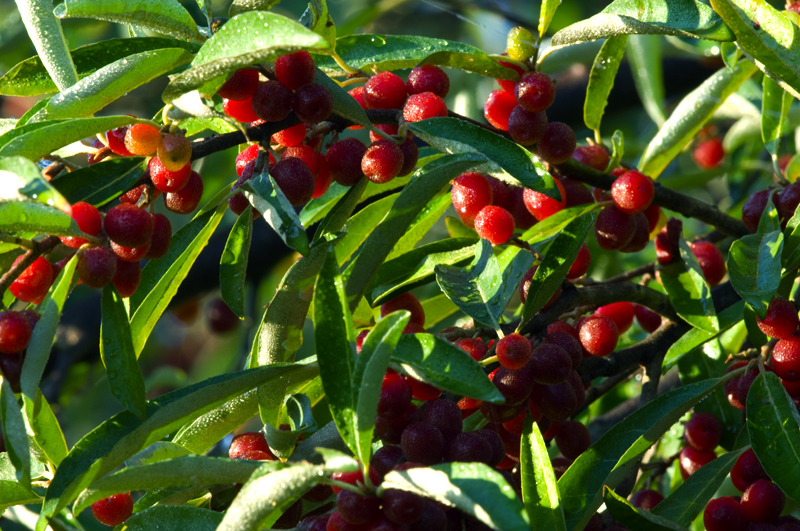 We use the ripe berries of the autumn olive bush in many recipes like jelly and dressing, they make great fruit leather and wine, and the ripe berries freeze well. 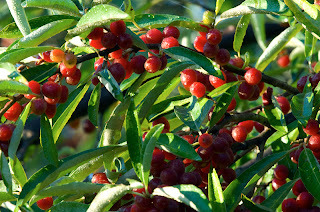 The berries are tart and astringent straight from the bush, but the flavor improves with the advancing of the autumn season and with a frost. While we had a rather poor harvest in 2012 probably due to a dry summer, we did manage to find enough to experiment with. 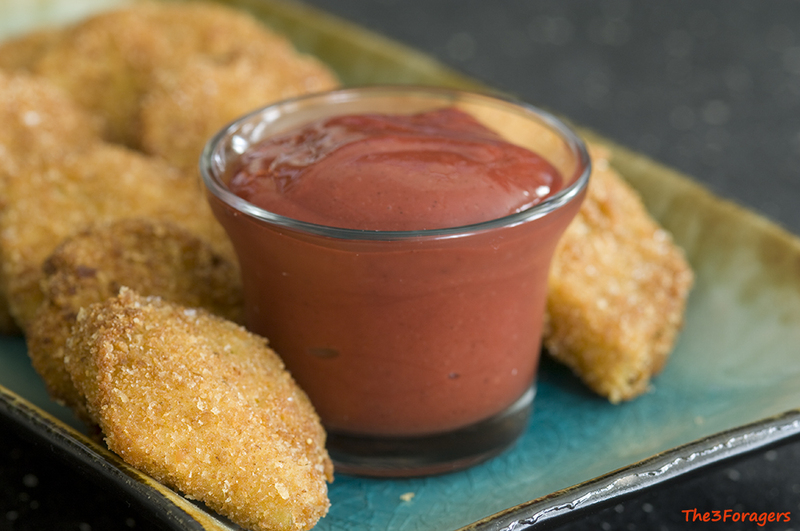 We have a recipe for ketchup using the red pulp of the autumn olive berries. I don't add any preservatives, so this is a small batch that should be kept in the refrigerator for a few weeks. This recipe is available in our book, due Spring 2016. Through a generous scholarship from CVMS, Robert, Gillian and I were able to attend one full day of the 34th Clark Rogerson COMA Foray on September 15. 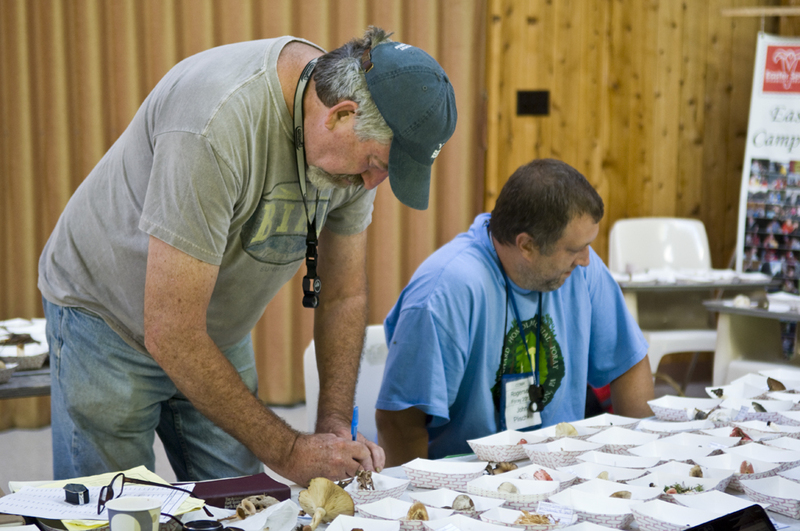 We went on a collection foray, participated in the foray identifications, attended the mycophagy session, took a dip in Camp Hemlocks’ pool, and attended Gary Lincoff’s slide show and presentation. 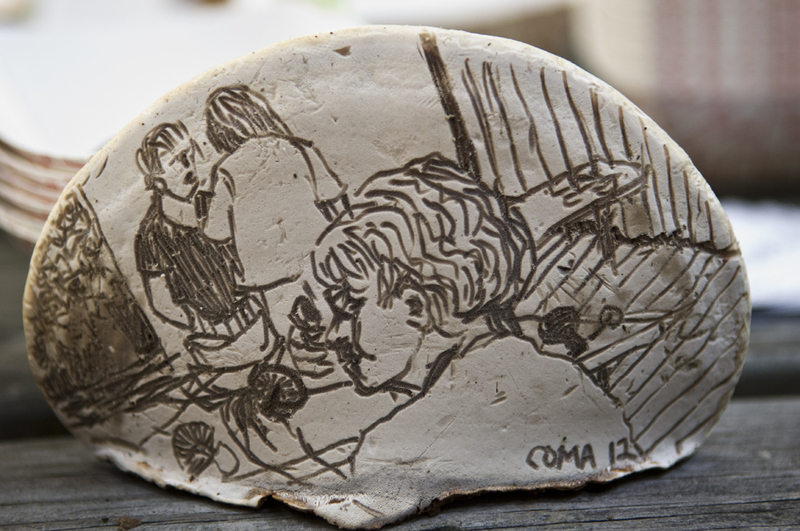 Gillian even managed to win an award for her drawing on her favorite mushroom, the artist’s conk (Ganoderma applanatum), presented by Gary. We arrived early to the Camp Hemlocks facility, around 8AM, to try to sign up for a collection walk. The weather had been dry for more than a week so we wondered if many mushrooms would be found. Fellow CVMS member Bill Yule took a group to Nehantic State Forest in Lyme, but CVMS member Connie Borodenko wondered if there was a wetter area we might explore, and Robert and I suggested the Sellew Preserve in East Hampton. 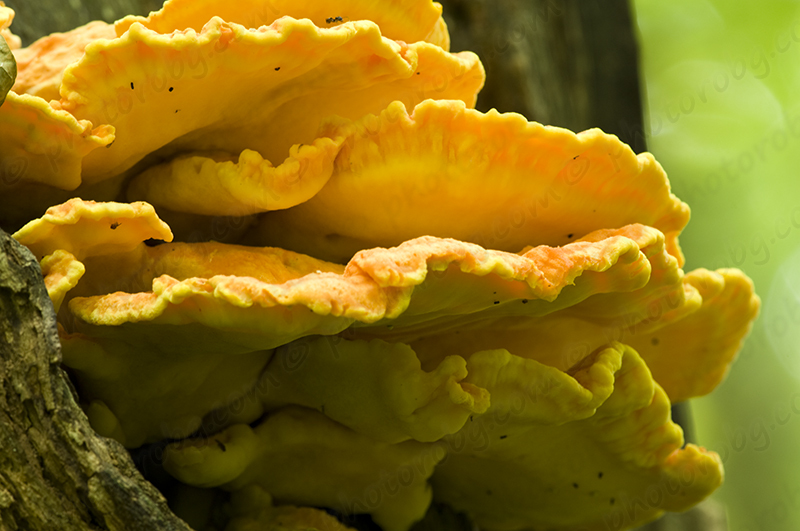 We headed out with Connie and Rhoda Rhodes to the nearby preserve, and almost immediately after we headed down the first hill, Robert found a chicken (Laetiporus sulphureus). He and Connie ended up with two grocery bags full at the end of the walk. Robert and Gillian bounded ahead to find many Cortinarius iodes and assorted Amanitas, while Rhoda and I took a lower path and walked slowly, looking for wood decayers and other small fungi. I found a small Fistulina hepatica and some cute hairy-topped Inocybes, while Rhoda grabbed some turkey tails (Trametes versicolor) and many Trichaptum biformes. We took a quick break for lunch and then drove over to an isolated spot at Salmon River State Forest on the way back where we picked up a few Cantharellus cinnabarinus and many Ganoderma applanatum for Gillian’s use. After we returned to the Hemlocks facility, Connie jumped right into identification, while I gave it a try. 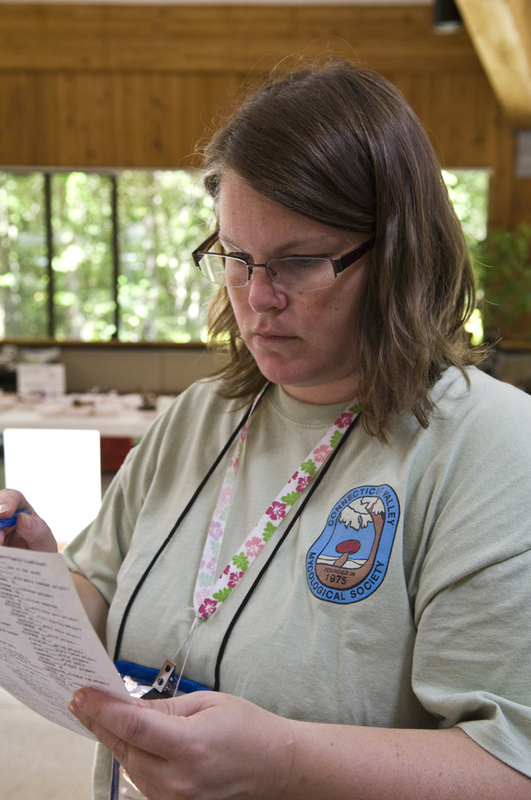 At this kind of foray, we label each find with a tag designating the finder, the origin of the specimen including its habitat (on wood, on the ground, hardwood or conifer forest), and the tentative ID. 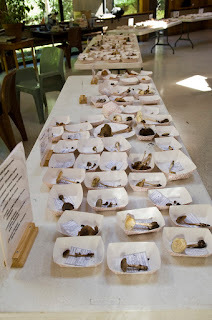 Then one of the official mycologists confirms the ID and moves the specimen to tables arranged by type, such as Boletes, Polypores, gilled fungi, and non-gilled fungi. Gillian took this time to run Carol Lambiase’s dog, Bolt, around the grounds. 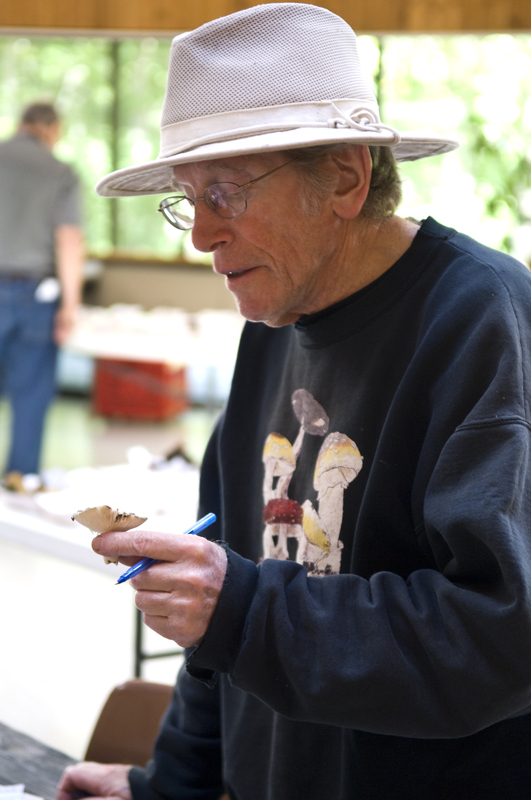 The official mycologists included our own Bill Yule, John Plishke from Pennsylvania, Roz Lowen, and Gary Lincoff. 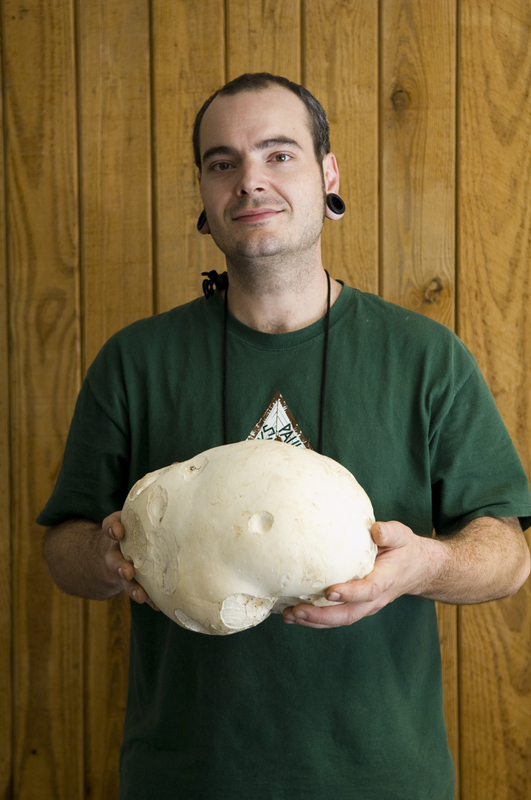 One of the most impressive finds of the day was a giant puffball (Calvatia gigantia) by Josh Hutchins, which he posed with happily. 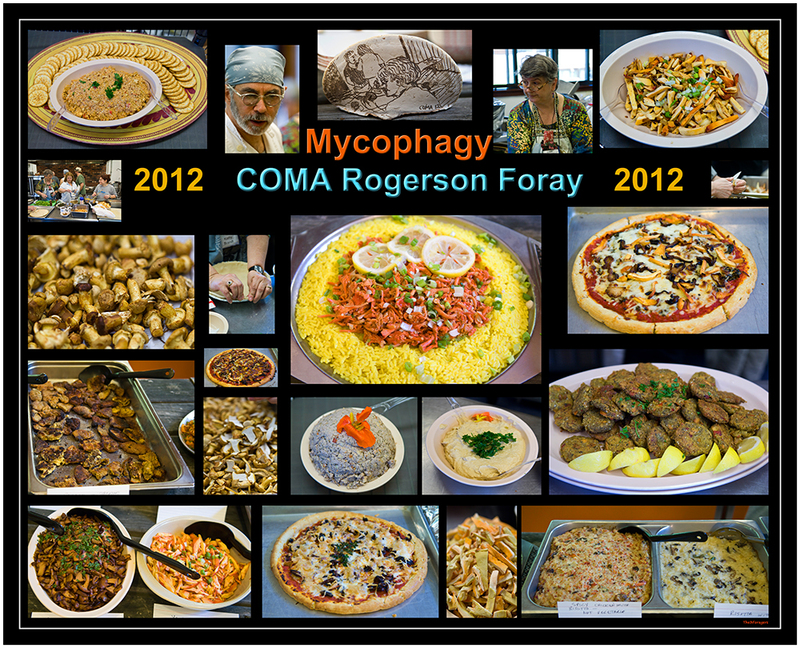 We eagerly anticipated the mycophagy session at 4PM, and CVMS and COMA members Joe and Kathy Brandt had promised a feast. The volunteers had been working all day in the kitchen to cook and present the buffet, featuring a lot of the sulphur shelf that had been found over the weekend. 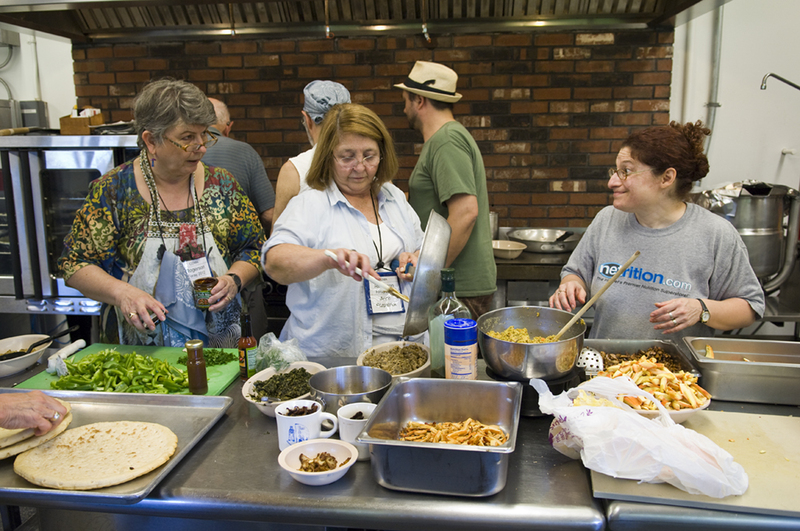 Some of the dishes included Lobster (Hypomyces lactiflorum) Quiche, Cinnabar Chanterelles with Saffron Rice, “Chicken” Felafels, Mushroom Risotto, and Oyster Mushroom Soup. Gillian then went to splash in the pool for an hour while we socialized with COMA members and revisited the ID room. The finale of the evening was the presentation by Gary Lincoff in the auditorium. There was a silent auction and awards ceremony. He discussed the inter-relationships of fungi, plants, and animals, and the exchange of nutrients between them with a slide show. We were also excited to pick up Gary Lincoff’s new book, The Joy of Foraging, and have him sign it, along with our dog-eared copy of the Audubon Society mushroom book. After a long 12 hour day, we returned home having met many new people and exploring the 350+ species found over the weekend. 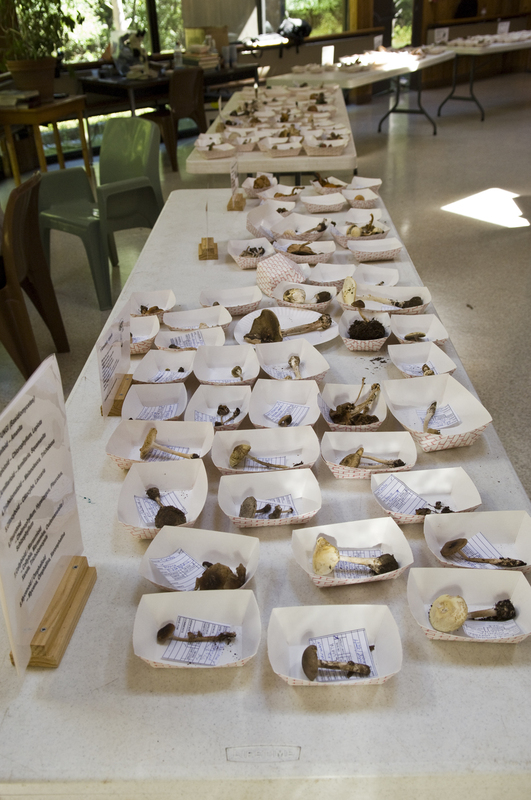 We did miss a few presentations that took place on Friday night, including one on Boletes by Bill Yule, which we hope he repeats someday. Robert took lots of photos, and while Gillian may have wished there were some kids around, she had a great time hanging out with Connie at the pool and hiking at the preserve. 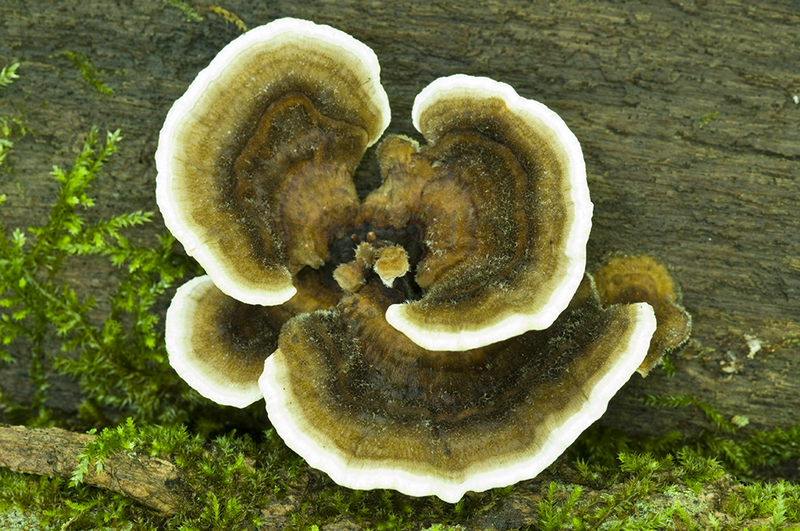 I took some of my first steps toward identifying some fungi with confidence, and enjoyed the social interactions with fellow enthusiasts. Autumn Olives (Elaeagnus umbellata) are an invasive and abundant berry in the southern New England area, and spreading west and south rapidly. Originally from Asia, they were promoted and planted as recently as the 1980's as bird cover and food, and erosion prevention shrubs. Now it is known that they are aggressive invaders, spread easily by the abundance of berries and seeds produced, the speed of maturity of a bush, and by their their ability to negatively alter the soil that they grow in by fixing nitrogen and making it difficult for other plants to grow. Autumn olive bushes often create entire fields of nothing but autumn olives. While they are an ecological pest, they do produce a tasty, nutritious, and abundant berry in the late summer and autumn season. 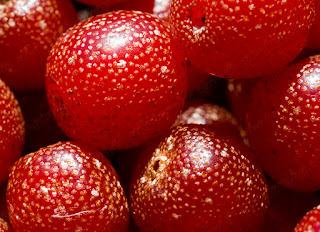 We have been eating and incorporating this berry into our diet for years, adding them raw to oatmeal, made into jams and jellies, and dried into fruit leather. The berries freeze really well by spreading them on a cookie sheet and freezing them, then bagging the frozen berries in plastic baggies. By adding them to recipes we would already have eaten, we are using them as a staple food in our diet, as opposed to a survival-only food. 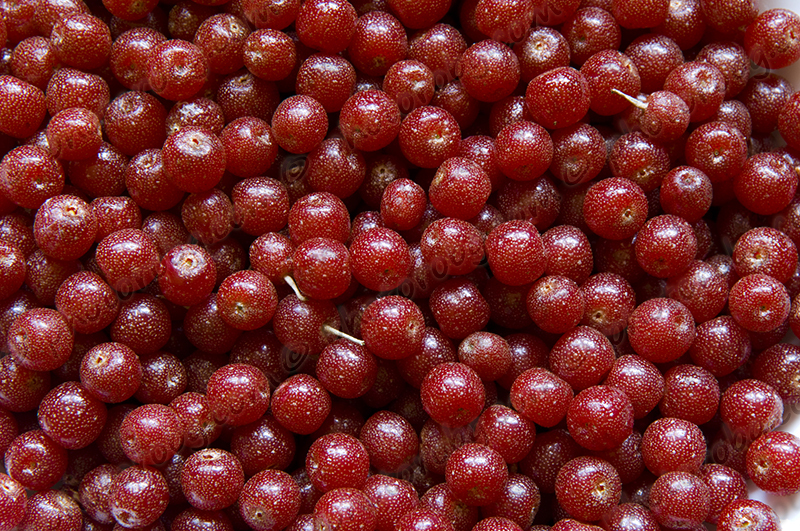 We are attempting to eat as seasonally as we can, and these tart, red berries work nicely into many recipes that we cook in the autumn. We often have cooked autumn olive puree on hand in the fridge to add to recipes, and it is made by cooking about 8 cups of fresh berries with 1/2 cup of water over medium heat for 5 minutes, until all of the berries have softened or burst open. Then I run the puree through a food mill to remove the seeds. When this puree sits in the fridge for a few days, it will separate into two layers, which I just whisk together before using the puree. 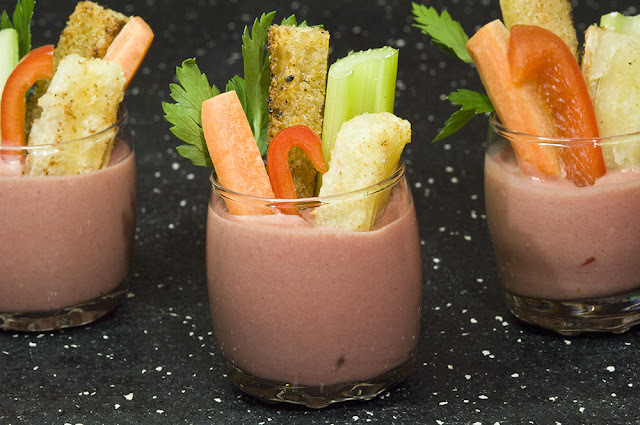 This recipe is for a thick, creamy dressing or dip. We served it with some toasted croutons, vegetables, and oven roasted yucca fries as a dip, but it would also nicely dress a green salad filled with walnuts and diced apples. When making the dressing, it thickens in the refrigerator after being chilled. 1. In a food processor or blender, combine the goat cheese, vinegar, and maple syrup and pulse. 2. With the food processor or blender running, add the olive oil and autumn olive puree, blending briefly until smooth. 3. Pour into a bowl, and whisk in the salt, pepper, and optional chopped tarragon. Chill about 20 minutes before serving with raw veggies for dipping, or dressed on a salad.